Bob Hinton, Erick Russell and Jessica Grossarth are members of the CBA’s Diversity Committee. We attended two very productive meetings this 4th Quarter led by Monte Frank where the committee discussed collaborating with the law schools and implementing the CBA diversity policy section by section. On October 8, Erick and Jessica attended the LGBT Section’s initial meeting of the 2015/2016 year at the Hartford Flavor Company. Dan Schwartz and Alix Simonetti spoke about CT’s legislation and laws concerning the transgender community. The leadership demonstrated by John Stafstrom and Erick Russell in connection with the Annual Connecticut Cares Event for Lambda Legal held on October 18 at Mitchell’s helped raise in excess of $400,000 for the organization! Erick Russell planned and participated in the Crawford Black Bar’s Winter Social. On November 12, P&C sponsored the Connecticut Hispanic Bar Association’s Annual Dinner at the Gershon Fox Ballroom in Hartford. Erick Russell, Rob Morris, Lee Hoffman, Mark Sommaruga, Bob Hinton, Rick Robinson, Mikaela Kurzawa, Judge Holzberg, Fred Klein and Kelly O'Donnell attended. Rob Morris, Judge Lynda Munro, Bob Hinton, Mark Sommaruga, Megan Carannante, Jon Kaplan and Jessica Grossarth continue to coach and mentor Posse scholars. Pullman & Comley attorneys and staff rolled up their sleeves at the former St. Margaret’s School in Waterbury to commemorate this year’s Dr. Martin Luther King, Jr. Day of Service, organized by the Diversity Committee. Nearly two dozen people assisted with cleaning, painting and restoring the former parochial school to make additional classroom space for the expanding Brass City Charter School (BCCS), which opened in June 2013. On March 11, 2016, a group of our attorneys volunteered at a mock trial competition of 5th grade teams from the Hall Middle School in Bridgeport. Kelly O'Donnell, Assaf Ben-Atar and Erick Russell coached the prosecution team in the mock trial of Paul Bunyan & his Blue Ox to a victory, including an award of $500 in damages. Mikaela Kurzawa helped coach the jury with staff from Yale New Haven Hospital. 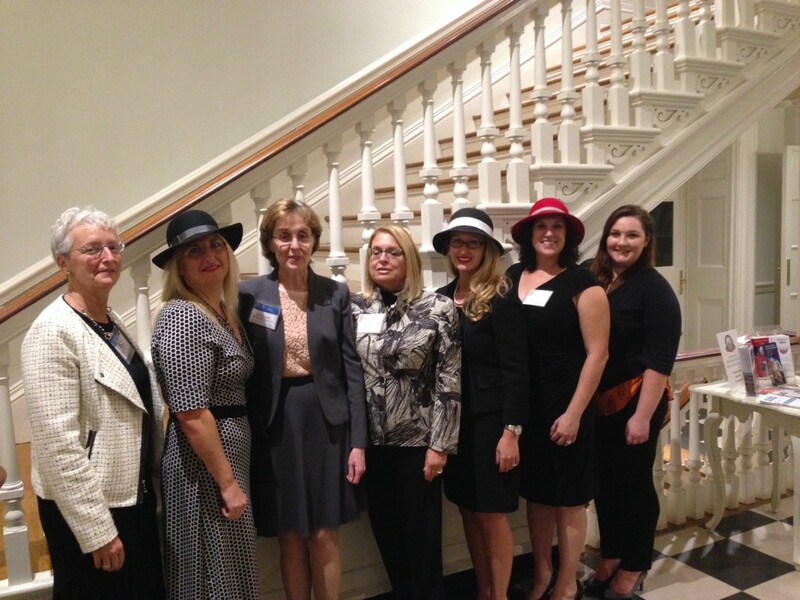 On October 14, our Women's Leadership Initiative held a very successful Women's Networking Tea at the Old State House in Hartford. The event, which brought together women professionals from the Greater Hartford business community, highlighted the work of The Children's Law Center (CLC), a nonprofit providing legal advocates to children in highly contentious family court cases. Pictured below are Pullman & Comley's Judge Lynda Munro (Ret. ), Justine Rakich-Kelly, Executive Director of CLC, Nancy D. Lapera, Chair of the Women's Leadership Initiative at Pullman & Comley, Rosalie Roth, CLC Director of Development, and three additional CLC staff members. On October 27, we teamed up with People’s Bank to hold our Third Annual Celebrating Diversity Event here in the Bridgeport lobby. The event was very well attended. Five local businesses – Connect Computer, Peralta Design, SuperSeedz, Taco Loco Restaurant and Catering, and W.C. McBride Electrical Contractors − showcased their products and services at the event. Bridgeport’s Small & Minority Business Resource Office, the Hispanic Chamber of Commerce of Greater Bridgeport, the Bridgeport Regional Business Council and the Greater New England Minority Supplier Development Council acted as supporting partners. During the reception, Armando Goncalves of People’s and Pullman & Comley chairman Tim Shearin honored and jointly presented a check to Scott K. Wilderman, President and CEO of Career Resources, Inc., a Bridgeport non-profit that assists jobseekers throughout Connecticut gain meaningful employment and succeed in the workforce.